Cannot start Microsoft Outlook. Cannot open the Outlook window. The set of folders cannot be opened. 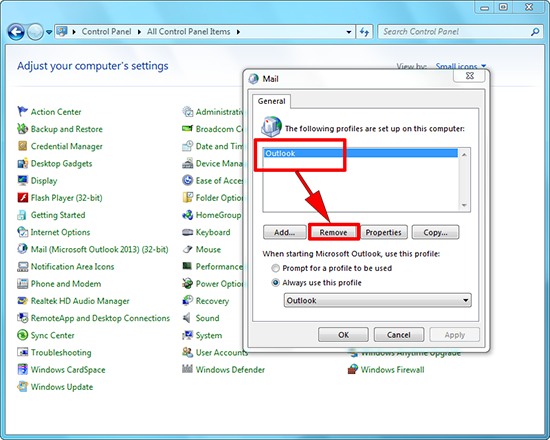 You must connect to Microsoft Exchange with the current profile before you can synchronize your folders with your Outlook data file (.ost). 1. At first I thought this was a user profile problem, so i logged on as another user (no difference). So I thought it was a problem with Outlook/Office on that PC. Until I built another one and it did the same. If you are seeing this error I suggest you remove the Outlook profile on the affected machine first. 2. Some Google searching told me this can happen if certain services have not started, as I had this problem on the same server, I checked the services and sure enough the Microsoft Exchange RPC Client Access’ service was not running. I could manually start it, and the error ceased. That’s great but I needed to deliver the server to a client and I wouldn’t be about to manually start services every time they rebooted it! 3. It turns out that this is a known problem if Exchange is installed on a Global Catalog server (being an SBS Server I don’t have much choice). it is supposed to be addressed by Microsoft KB940845, I say ‘supposed to‘ because this did not work. 4. Despite my best efforts, this service refused to start with the server, so I clipped on my spurs and wrote a startup script that waits three minutes after the server starts then it manually starts the service for me. You can put it in the servers Startup folder, or (as I did) assign the startup script via group policy. Note: This script waits 180 seconds, you can change the interval if you wish.